A. We don't need the sugar in the house from the store bought candy. If you are new to my blog then this recipe is not typical of what you will usually find here. I try to keep the recipes simple BUT every once in a while I need to make something fabulous and this cake was a great place to start our holiday baking. I guess this cake is the gourmet part of the blog. Don't let the long list of ingredients deter you from making this absolutely delicious cake. I didn't have to buy one thing at the store because I already had every thing in my kitchen. When I visited NYC in October I bought myself the Wilton 5 piece layered cake set. The cake pans are about 8 inches round and 1 inch thick. This cake is small but very very tall. I never make cakes anymore and my kids miss it. I want to start making a few more cakes in 2015 using this cake pan set. I like how small the cake rounds are. The tall cake just looks awesome for the kids. We can eat this cake, a family of 6, a bit easier than if I use regular round cake pans. It seems I was always throwing cake away--can you believe that--but I really did. I found the original recipe over at Wicked Good Kitchen. She has all of the instructions for the Brandy Sauce and the Coconut Cream Whipped Topping. Below you will find my interpretation and the three components I used to make this awesome cake. It requires time, I won't lie. I made this cake while I taught Isabella school. It worked out perfectly because I was already in the kitchen area and had time to bake and teach while Isabella did her work. I might even suggest that making the caramel sauce the day before will save you some time. It took almost an hour and a half for me to make it and to allow it to cool. The total time for the cake, sauce, whipped topping and assembly was about 2.5 hours. And you know what? I plan on spending that amount of time this week making it again--it was delicious! This cake is a show stopper and one that will knock your socks off when you take your first bite. To cut the cake you might have to have Ninja Knife Skills but having a sharp knife and a spatula helps a lot. I used the spatula or another knife to hold up the cake and the second knife to cut the slice. The cake fell onto the spatula and I was able to transfer it to a large plate. 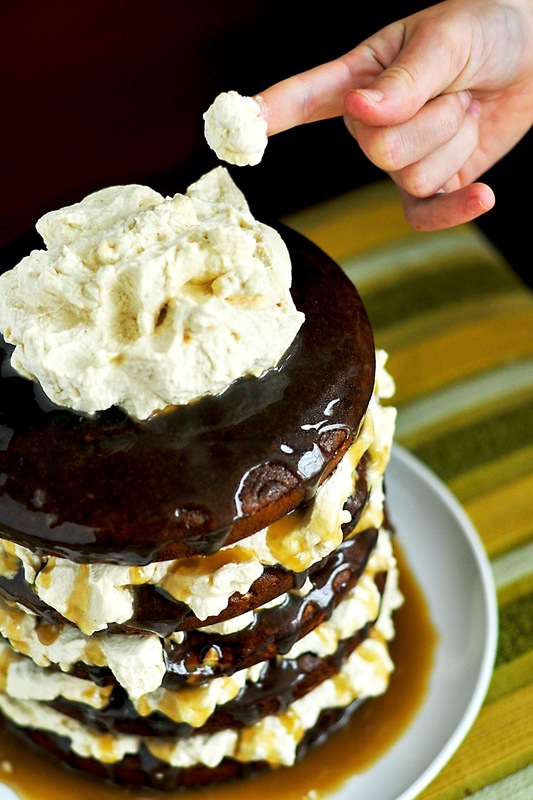 If you have extra whipped topping or caramel sauce, you can drizzle more on the slices. To be honest--I used it all on my cake below--so next time I may save a bit for presenting the slices to my family. 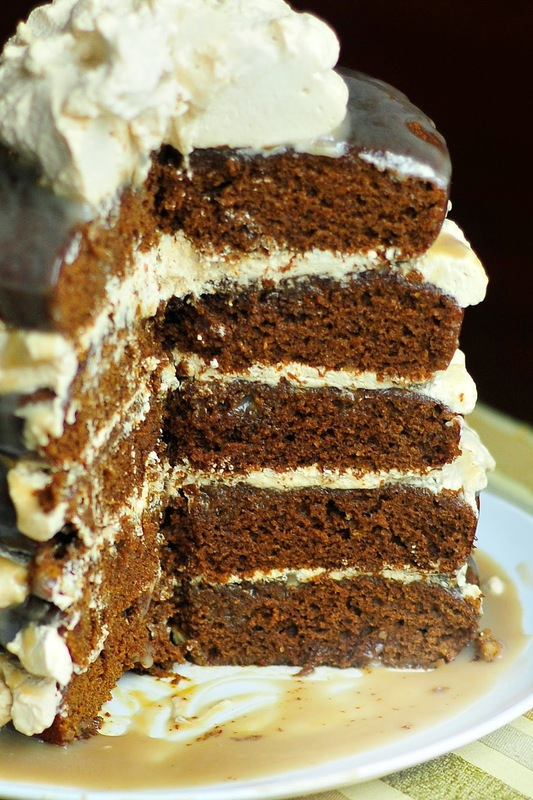 The gingerbread cake is rich in flavor with the molasses and maple syrup. I wouldn't say the cake is super sweet (and I like that) but the caramel sauce and whipped topping balance nicely because they are sweet. Make adjustments according to your family's likes and sweet tooth. AGAIN--don't panic by the size of the ingredient list or steps. It is not a hard recipe and is much easier than it looks. I promise! Also, read through the instructions SEVERAL times before you make the cake. I am always here to answer any questions. Send me an email or comment and I will get right back to you. It is worth the work! Please share this recipe on Twitter, Facebook, Stumbled Upon, Pinterest or Google +. It helps to spread this recipe with friends and neighbors. THANKS! I used the weight (grams) measurements to make my cake in the pictures. For coconut whipped cream see the original recipe HERE. 2 tablespoons maple syrup (this can be replaced with plain sugar but you may not get the deep caramel color as seen in the pictures). I recommend making the caramel sauce first. This allows the sauce to cook, cool and be ready to work with when the cake is done. 1. Use a heavy bottom pan. I used my 10 inch cast iron frying pan. It worked great! Set heat to medium high. In the frying pan, add all of the coconut caramel sauce ingredients and whisk together. Heat caramel sauce until small bubbles appear--gentle boil. 2. Use only a wooden spoon to stir for the first minute. Reduce heat to medium low and try not to stir too often until the end. I set my stovetop to 3 and it was hot enough. The caramel kept a slow boil going for 35 minutes. Watch sauce so it does not burn. The caramel sauce will start to turn from a creamy pale color to a caramel color. The sauce will reduce and become very thick, coating the back of the wooden spoon nicely. 3. When caramel is thick and not too dark, remove from heat and transfer to a glass bowl. Stir and let set to cool. The color with cloud slightly once it is completely cool but when warmed again, it will return to a nice caramel color. 1. Preheat oven to 325. I sprayed each of my five pans with cooking spray or you can use coconut oil. The pans are so shallow that the layers pop out quite nicely. If you are using larger cake pans, then see Stacy's site for instructions. 2. In a medium bowl combine all of the dry ingredients. Stir to combine. 3. In a large table top mixer (I used my Kitchenaid) add egg whites and cream of tartar. Whip until egg whites are stiff. 4. In a separate bowl add wet ingredients: egg yolks, coconut milk, maple sugar, molasses, and vanilla. Whisk to combine. 5. I added the wet ingredients to the dry ingredients and mixed together until combined. I then added the egg whites and gently folded them into the cake mix. 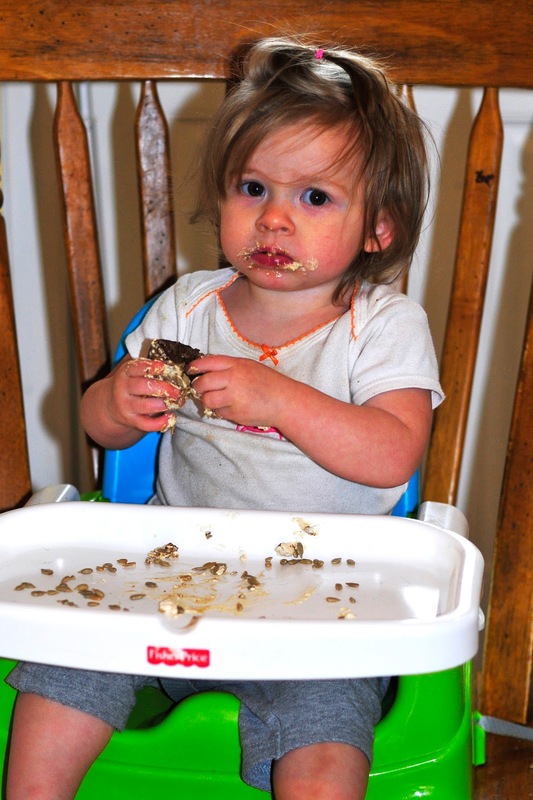 This reminds me of when I make our chocolate roll cake--kind of the same texture and process. Let the cake batter sit for 5 minutes. 6. Sprinkle the chopped pecans in the bottom of each cake pan. Add batter to each of the five pans. The batter came almost to top of each cake pan. Hit cake pans on table to release any air bubbles. Bake until firm to the touch--about 12 minutes. These are small cake pans so the cook time is very short. 7. When baked, let cool for a few minutes and then flip them out onto a cookie wire rack to cool completely. 1. Pour ingredients into a bowl. Whip until thick. I used my Kitchenaid for this process but you can easily use a hand mixer too. The whipped topping comes out slightly brown because of the maple syrup. I like the color of it on the cake. 1. 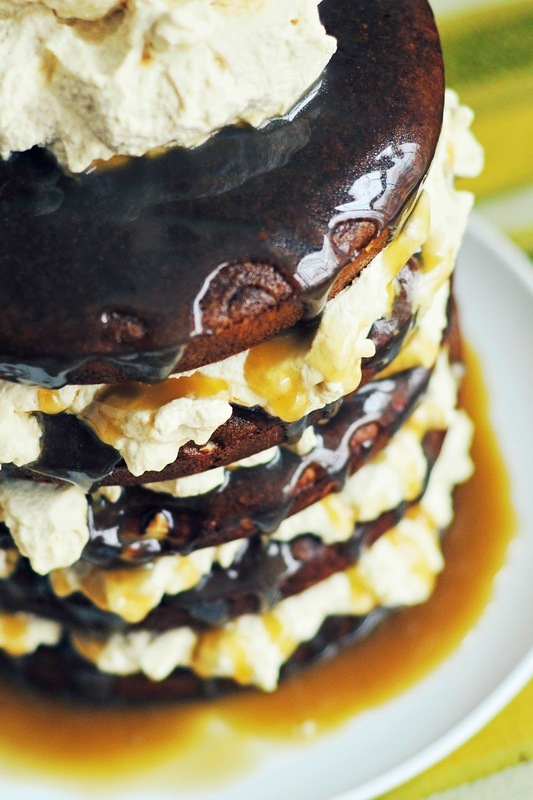 Have the cooled cakes, the coconut caramel sauce and the whipped topping ready. 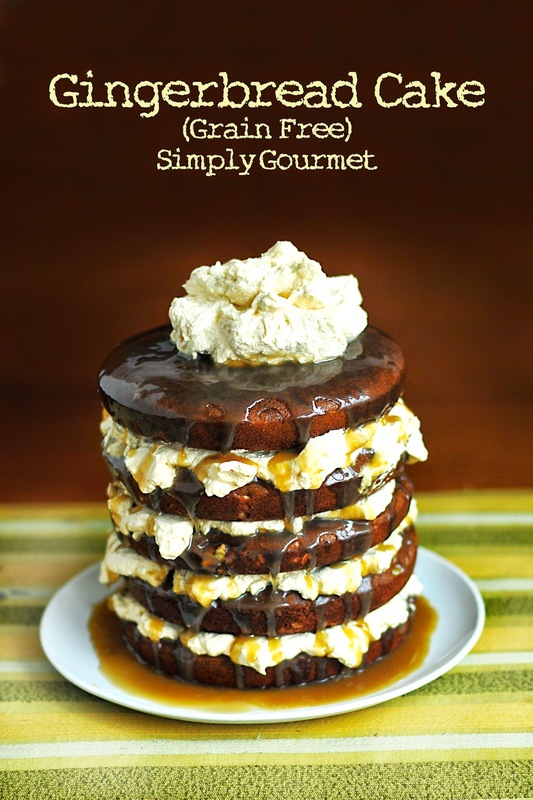 Drizzle the coconut caramel sauce over the 5 cake layers while on the cookie rack. 2. I layered the cake like this: cake layer, whipped topping, repeat until all 5 layers are used. I topped the cake with the remaining whipped topping and drizzled more caramel over the top of the cake so that the sides were dripping with sauce. I have attached links to my amazon account so that you can see the products that I used in making this cake. No purchase is necessary. I do make a small commission from all sales but that money is put back into the blog for recipe developing. Thanks! I use this brand of almonds to make my almond nut flour. I know they have the skins on and honestly this has not made any difference in my baking when I process the flour in my Vitamix. They are cheaper to buy in bulk too.